This was so tremendously helpful! I was able to get some really helpful advice about what to bring with me to the appointment that will help me make the most of a very expensive neuro consult. The vet was super helpful and knowledgeable and gave me really good tips about what would help the doctor make his diagnosis. While the vet was not able to tell me what was wrong with my pet being able to speak with her was very informative. Very helpful and professional. Felt very confident with the answers I received. 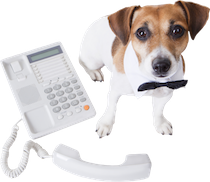 If I tried to call the poison hotline for pets, it would have cost me $49. This service gave me quick answers and reassurance.